When it comes to your roof, shingles often get all the credit. Asphalt shingles look nice, they stand up to the weather and they’re tough and durable. Shingles, though, are only part of the whole roof system. The unsung hero of the operation is roof flashing. Flashing is a flat, thin, weatherproof material that, with the help of underlayment, keeps water from getting underneath your shingles. Most flashing is made from metals like aluminum, copper or stainless or galvanized steel. Flashing can be used around windows, doors, chimneys, gutters — basically any exterior joint where water needs to run off. Flashing is critical to certain areas of your roof — namely, the places where the roof surface meets a wall (sidewalls and front walls), the low points where two roof slopes meet (called valleys), roof protrusions (bathroom/kitchen vents, skylights) and the roof’s edges (rakes and eaves). A “wall” on a roof is where a vertical wall of the house intersects the surface of the roof deck. Sidewalls: Vertical walls along the edge of a sloping roof deck (area to the left in the photo below). Front walls (also called headwalls): Vertical walls behind a sloping roof deck (area to the right in the photo below). As wind blows and rain pours, you can imagine how water would be blown against the walls of this home. The water would run down the wall and right into the joint where it meets the roof deck below. Flashing prevents this from happening. Thanks to flashing at the joint, water is stopped before it gets between the wall and the shingles and is directed into the gutters. Roof flashing acts sort of like a gutter for your roof deck! Step flashing should ALWAYS be used where the roof deck meets a sidewall. 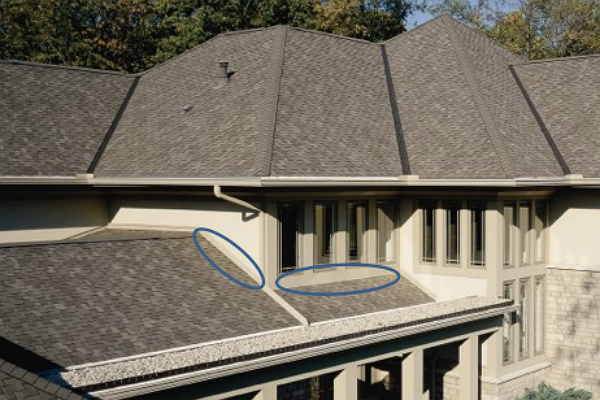 Pieces of step flashing are bent at an angle relative to the roof pitch and installed along the full length of the sidewall where it joins the roof deck. The flashing should be partially exposed along the wall. Since you can see step flashing, some homeowners choose a more expensive flashing material like copper to achieve a certain aesthetic. Base flashing is the solution for front walls. Base flashing is one length of flashing that is bent (along the length) to match the pitch of the roof. Base flashing is installed over underlayment, but under siding and shingles, so you may not be able to see it from the ground. Valleys are the places where two roof decks slope toward one another, creating a low line that looks like a valley between two mountains. Water flows into the valleys on your roof the same way rivers wind through mountain valleys. Valleys, as you’d imagine, are a prime target for water penetration. Some shingles can be woven to provide extra layers of protection to the roof valleys. However, many dimensional shingles are simply too thick and inflexible to be woven. Metal valley flashing is installed over the underlayment, but under the edges of the shingles. In this “open valley” style, the shingles over each section of roof do not touch. They are installed to overlap and form a gap that exposes the valley flashing. This allows water to run off the edges of each roof, into the valley flashing, and down to the gutters. Valley flashing is visible from the ground. Some homeowners choose a unique color of valley flashing to add a striking contrast to the color of their shingles. Penetrations like vents, skylights, chimneys and dormers are the more complicated roof features when it comes to flashing. Each feature requires a unique set of materials and installation techniques to provide a water-tight seal. While the flashing needs at each penetration site may differ, waterproofing these locations is always critical. Drip edge directs water at the edge of your roof so that it won’t get under your roofing materials or rot the wood at the edges. Drip edge is MOST important at the rake edges of your roof, but it’s still good to have at the eave edges, as well. Did you know that the most common cause of all home insurance claims is exterior wind damage? According to The Travelers Companies Inc., 25% of all losses from 2009-2015 were due to wind damage. During severe winds, shingles are more likely to lift along the rake edges where they don’t have the benefit of shingle overlap at the edge. Flashing wrapped at the rake edge gives that extra layer of defense. Your shingles and gutters do most of the work at the eaves, so the drip edge is merely on-call support. Drip edge at the eaves protects the fascia board from water caused by clogged gutters or ice dams. While some roofs may not have walls or valleys (a hip style roof doesn’t have either!) that need to be flashed, all roofs can benefit from drip edge at the eaves. Your roofing professional can explain the best options for your roof’s particular needs. Roof flashing is different on every home because it is always tailored to your roof’s unique features. The type of shingles you’ve selected and the style of your home have a lot to do with the types of flashing that your roofing professional will recommend. Holding out for a hero to save your roof? This post was originally published on Nov. 22, 2016 and was updated on Jan. 18, 2018 for content and clarity.